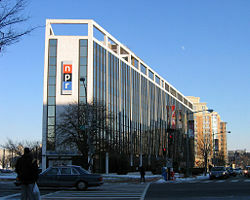 National Public Radio headquarters at 635 Massachusetts Avenue NW in Washington, D.C.
National Public Radio (NPR) is an independent, private, non-profit membership organization of public radio stations in the United States. NPR was created in 1970, following congressional passage of the Public Broadcasting Act of 1967, signed into law by President Lyndon Johnson, which established the Corporation for Public Broadcasting and led to the creation of the Public Broadcasting Service (PBS). The network was founded on February 26, 1970, headed by founder Robert Conley and a partnership of journalists, with 30 employees and 90 public radio stations as charter members. Like its fellow public radio networks, American Public Media and Public Radio International, NPR produces and distributes news and cultural programming. Its member stations are not required to broadcast all of these programs and most public radio stations broadcast programs from all three providers. Its flagship programs are two "drive-time" news broadcasts, Morning Edition and the afternoon All Things Considered; both are carried by nearly all NPR affiliates and in 2002, were the second- and third-most popular radio programs in the country. NPR was incorporated in 1970, taking over the National Educational Radio Network. NPR hit the airwaves in April 1971, with coverage of the United States Senate hearings on the Vietnam War. The next month, All Things Considered debuted, hosted by NPR founder Robert Conley. NPR was merely a production and distribution organization until 1977, when it merged with the Association of Public Radio Stations. As a membership organization, NPR was now charged with providing stations with training, program promotion, and management; representing public radio before Congress; and providing content delivery mechanisms such as satellite delivery. NPR suffered an almost fatal setback in 1983, when an attempt to expand its services backfired, and the company found itself nearly seven million dollars in debt. After a congressional investigation and the resignation of NPR's president, the Corporation for Public Broadcasting agreed to loan the network money to stave off bankruptcy. In exchange, NPR agreed to a new arrangement whereby its annual CPB stipend would be divided among local stations instead, which would then support NPR productions on a subscription basis. NPR also agreed to turn its satellite service into a cooperative venture, making it possible for non-NPR shows to get national distribution. It took NPR another three years to pay off all its debt. NPR is a membership corporation. Member stations are required to be noncommercial or educational radio stations, have at least five full-time professional employees, operate for at least 18 hours per day, and not be designed solely to further a religious philosophy or be used for classroom programming. Each member station receives one vote at the annual NPR board meetings—exercised by its designated Authorized Station Representative (A-Rep). To oversee the day to day operations and prepare its budget, members elect a Board of Directors. This board is comprised of ten A-Reps, five members of the general public, and the chair of the NPR Foundation. Terms last for three years and rotate such that some stand for election every year. Provide access to the intellectual and cultural resources of cities, universities, and rural districts through a system of cooperative program development with member public radio stations. Produce materials specifically intended to develop the art and technical potential of radio. The NPR web site offers annual reports, IRS 990 forms, and audited financial statements. According to the most recent 2005 financial statement, NPR makes just over half of its money from the fees and dues it charges member stations to receive programming, although some of this money originated at the CPB itself, in the form of pass-through grants to member stations. About two percent of NPR's funding comes from government grants and programs (chiefly the Corporation for Public Broadcasting); the remainder comes from member station dues, foundation grants, and corporate underwriting. Typically, NPR member stations raise about one-third of their budget through on-air pledge drives, one-third from corporate underwriting, and one-third from grants from state governments, university grants, and grants from the CPB itself. The two percent figure above refers only to money contributed by the federal government directly to NPR. Additional government money makes its way to NPR indirectly. This is because the government (again chiefly the Corporation for Public Broadcasting) provides some funding to NPR member stations, the states (and via the states' state universities) in addition to the funding provided to NPR itself. Since these member stations contribute to NPR (in the form of dues and programming fees), the federal government's portion of NPR's budget is significantly higher than two percent, and the total government expenditure is higher still. Over the years, the portion of the total NPR budget that comes from government has decreased. During the 1970s and early 1980s, the majority of NPR funding came from the government. Steps were being taken during the 1980s to completely wean NPR from government support, but the 1983 funding crisis forced the network to make immediate changes. More money to fund the NPR network was raised from listeners, charitable foundations, and corporations, and less from the government. In contrast to commercial radio, NPR does not carry traditional commercials, but has advertising in the form of brief statements from major donors, large business corporations. These statements are called underwriting spots, not commercials, and, unlike commercials, are governed by FCC restrictions; they cannot advocate a product or contain any "call to action." Critics of NPR have complained that describing public radio as "commercial free" is "transparently false." In 2005, corporate sponsorship made up 23 percent of the NPR budget. Since NPR is not as dependent on revenue from underwriting spots as commercial stations are on revenue from advertising, its programming decisions may be less ratings-driven. Nevertheless, some listeners have stopped listening to NPR member stations due to NPR underwriting statements. On November 6, 2003, NPR was given over $225 million from the estate of the late Joan B. Kroc, widow of Ray Kroc, founder of McDonald's Corporation. This was a record—the largest monetary gift ever to a cultural institution. For context, the 2003 annual budget of NPR was $101 million. In 2004 that number increased by over 50 percent to $153 million due to the Kroc gift, as the bequest required that $34 million be spent to shore up operating reserves. NPR has dedicated the earnings from the remainder of the bequest to expanding its news staff and reducing some member stations' fees. The 2005 budget was about $120 million. NPR's major production facilities have been based in Washington, D.C. since its creation. On November 2, 2002, a West Coast production facility, dubbed NPR West, opened in Culver City, California. NPR opened NPR West to improve its coverage of the Western United States, to expand its production capabilities (shows produced there include News & Notes and Day to Day), and to create a fully functional backup production facility capable of keeping NPR on the air in the event of a catastrophe in Washington, D.C. According to a 2003 Washington Monthly story, about 20 million listeners tune into NPR each week. On average they are 50 years old and earn an annual income of $78,000. Its audience is predominantly white; only about 10 percent are either African American or Hispanic. Many of its listeners consider NPR to be at the apex of journalistic integrity. From 1999 through 2004, listenership has increased by about 66 percent. This increase may have been the result of any of a number of factors, including audience interest in coverage of the September 11 terrorist attacks and the subsequent military actions, a general lack of interest in other terrestrial radio outlets, and an increase in NPR news and talk programming (instead of jazz or classical music). NPR attracted these new listeners at the same time that the size of the overall radio audience in the United States was decreasing rapidly as people abandoned the medium in favor of digital audio players. In recent years, NPR has made some changes to appeal to younger listeners and to minority groups. From 2002 until 2004, Tavis Smiley hosted a show targeted towards African Americans, but left the network, claiming that the organization did not provide enough support to make his production truly successful. Smiley did return to public radio in April 2005, with a weekly show distributed by Public Radio International (PRI). NPR stations have long been known for carrying European classical music, but the amount of classical programming carried on NPR stations and other public radio outlets in the U.S. has declined. Many stations have shifted toward carrying more news, while others have shifted to feature more contemporary music that attracts a younger audience. Many conservative Republicans have alleged that the network tailors its content to the preferences of an audience drawn from a liberal "educated elite." While members of NPR's audience are more likely to be college educated than those who listen to other radio outlets, Fairness and Accuracy in Reporting, a self-labeled "progressive" media watchdog group, disputes the claim of a liberal bias. A study conducted by researchers at the University of California-Los Angeles and the University of Missouri found that while NPR is "often cited by conservatives as an egregious example of a liberal news outlet," "[b]y our estimate, NPR hardly differs from the average mainstream news outlet. Its score is approximately equal to those of Time, Newsweek, and U.S. News & World Report and its score is slightly more conservative than the Washington Post's." Liberal critics have alleged that NPR caters to its corporate funders and shies away from controversial topics. Many of them believe that NPR avoids the sort of journalism that would embarrass companies that are large, private donors to NPR programming. In addition to the perception of avoiding direct criticism of corporate sponsors, NPR has had very real threats of funding cuts, especially while Republicans led the House of Representatives. Supporters contend that NPR does its job remarkably well. A study conducted in 2003 by the polling firm Knowledge Networks and the University of Maryland’s Program on International Policy Attitudes showed that those who get their news and information from public broadcasting (NPR and PBS) are better informed than those whose information comes from other media outlets, including cable and broadcast TV networks and the print media. In particular, 80 percent of Fox News viewers held at least one of three common misperceptions about the war in Iraq; only 23 percent of NPR listeners and PBS viewers were similarly misinformed. African-American community activists have criticized NPR for not being responsive to their interests and those of other minority ethnic groups. Tavis Smiley, a well-known black talk-show host, resigned from NPR claiming that NPR did not effectively promote his daily program to minority communities. In addition, he received complaints from listeners stating that his sound was too harsh and grating for public radio. In 2005, Smiley returned to public radio with a weekly program distributed by Public Radio International. After Smiley's resignation, the African-American centered topics were picked up by a regular substitute host, the Emmy Award-winning Ed Gordon, naming the new show News and Notes with Ed Gordon. Gordon left in 2005 because of difficulty working on the East Coast while the rest of the production team worked in Los Angeles, and was replaced with Farai Chideya, a news correspondent. Despite the criticisms, NPR has nurtured several top minority journalists, including senior correspondent Juan Williams, Richard Gonzalez, and Mandalit del Barco. A 2004 Fairness and Accuracy in Reporting (FAIR) study concluded that "NPR’s guestlist shows the radio service relies on the same elite and influential sources that dominate mainstream commercial news, and falls short of reflecting the diversity of the American public." Like PBS in television, NPR in radio has proven itself a valuable part of the public broadcasting and the overall broadcasting available in America. NPR provides many listeners with a haven from the commercial driven talk or Top 40 programming broadcast by many other radio stations. Though NPR has been criticized for being too high-minded, this type of programming is a welcome respite to many and in fact helps to stimulate public discourse through its often nuanced approach to difficult subjects. Government funding for programming also means that NPR caters to areas that would not necessarily be covered were decisions based solely on commercial viability. ↑ Public Broadcasting Policy Base, GAO statement on NPR financial crisis, 1984. Retrieved March 16, 2007. ↑ The Current, History of public broadcasting in the United States. Retrieved March 16, 2007. ↑ The Current, National Public Radio Purposes. Retrieved October 13, 2008. ↑ The Anchorage Press, Radio underwriting is not "commercial." Retrieved October 13, 2008. ↑ NPR Stations, 2005 Budget. Retrieved October 13, 2008. ↑ Archinect, I want to turn off NPR, but I can't. Retrieved March 16, 2007. ↑ National Public Radi, Receives a Record Bequest of More Than $200 Million. Retrieved October 2, 2006. ↑ The Current, Kroc gift lets NPR expand news, lower fees. Retrieved October 13, 2008. ↑ FAIR, What's FAIR? Retrieved April 12, 2007. ↑ 10.0 10.1 Steve Rendall and Daniel Butterworth, How Public is Public Radio? Extra! Retrieved April 12, 2007. ↑ Tim Groseclose, Media Bias Is Real, Finds UCLA Political Scientist, UCLA News. Retrieved April 12, 2007. ↑ The Current, Pubcasting helps audience sort fact, fiction. Retrieved October 13, 2008. ↑ World Public Opinion, Misperceptions, the Media and the Iraq War. Retrieved October 13, 2008. Barsamian, David. 2001. The Decline and Fall of Public Broadcasting: Creating Alternative Media. Cambridge, MA: South End Press. ISBN 0896086542. McCauley, Michael P. 2005. NPR: The Trials and Triumphs Of National Public Radio. New York: Columbia University Press. ISBN 0231121601. McCourt, Tom. 1999. Conflicting Communication Interests in America: The Case of National Public Radio. Westport, CT: Praeger Publishers. ISBN 0275963586. Mitchell, Jack W. 2005. Listener Supported: The Culture and History of Public Radio. Westport, CT: Praeger Publishers. ISBN 0275983528. Phillips, Lisa A. 2006. Public Radio: Behind the Voices. CDS Books. ISBN 1593151438. History of "National Public Radio"
This page was last modified on 9 November 2018, at 18:12.